Yesterday The Conservative Treehouse posted an article that illustrates how you find people in government that are leaking to the press. The method used is rather obvious, but also rather brilliant. One of the most effective weapons of the ‘deep state‘ is leaks. Simply putting a stop to those leaks will allow President Trump to govern much more effectively. That’s how you catch the leakers. Frankly, I think that there are better choices than McMaster for national security advisor, but it really doesn’t look as if he is going anywhere right this second. However, I suspect the people who leaked to The Washington Post may be out looking for jobs! So far no one has come forward saying that anything in the Nunes memo is untrue. The charges have been that it somehow endangers national security or that it is partisan. There is no evidence of either–in fact it may have done nothing more than expose the partisanship of governmental organizations that are supposed to be non-partisan. The Washington Times posted an article yesterday indicating its choice for winners and losers in the release of the memo. The article lists the winners as President Trump, Representative Devin Nunes (author of the memo), the Republicans, and the American people. The American government is not supposed to operate in secrecy except where necessary for national security. National security was not involved in the surveillance of President Trump–politics was. The losers are listed as James Comey and Andrew McCabe are totally compromised by their actions. They have lost their jobs due to engaging in the political shenanigans of the Obama Administration. Christopher Steele, whose personal feelings about Donald Trump strongly interfered with his integrity is also listed as a loser with the release of the memo. Rod Rosenstein, who signed off on a questionable FISA warrant that began the entire illegal process, is also listed. Lastly, Robert Mueller, whose investigation now appears to be based on a fraudulent dossier and whose role as special prosecutor has become a witch hunt, is named in the article as a loser. Generally speaking, the losers are the people involved in this scandal who were willing to use their positions in the government (and government agencies) for partisan purposes. It is time for all of the losers listed to find other avenues of employment. 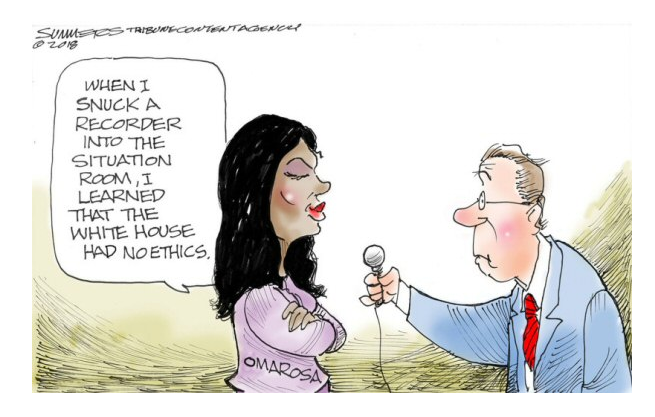 It is quite possible that laws were broken and some of them belong in jail, but I am not sure Congress is that committed to justice at this point. It will be interesting to see what the Inspector General recommends. It’s no secret that the mainstream media does not love President Trump. 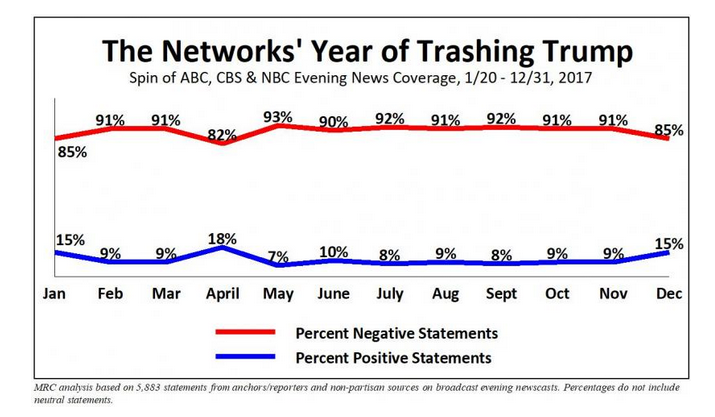 It is no secret that the percentage of Americans who get their news from said mainstream media do not like President Trump. 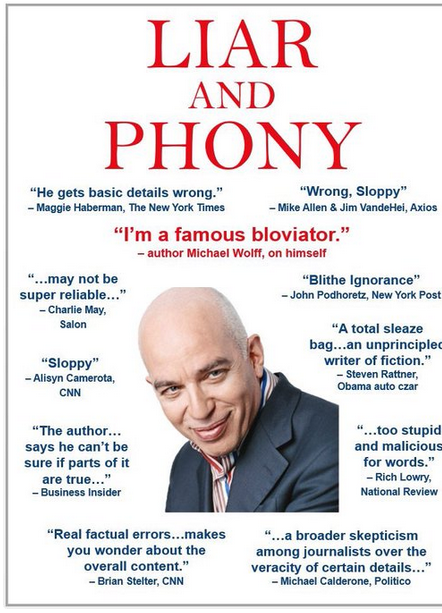 So all you need to do to create a best selling book is say horrible things about the President and those around him. Those things don’t have to be true–you can even say in your introduction to the book that they might not be true–it doesn’t matter–you should have a best seller on your hands. Well, maybe. But what if you are dealing with people who understand the media? If you choose to read this piece of garbage, at least you won’t have to pay for it! President Trump touts his administration’s advanced progress on deregulation, saying for every one new regulation — 22 are eliminated. From the White House Thursday, the president said this will allow the U.S. to build and create more jobs. 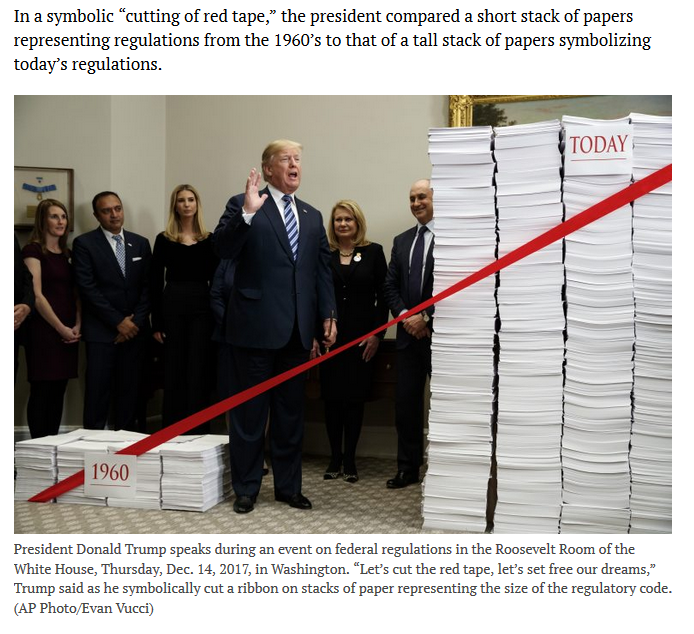 In a symbolic “cutting of red tape,” the president compared a short stack of papers representing regulations from the 1960’s to that of a tall stack of papers symbolizing today’s regulations. President Trump has stated that his goal is to get the stack of regulations smaller than the stack from 1960. This story is based on articles in Politico, The Conservative Treehouse, and The Washington Examiner. All three articles deal with comments by former interim CIA Director Mike Morell about the politicization of the CIA during the presidential election campaign on 2016 and after President Trump was elected. And then he sees a former acting director and deputy director of CIA criticizing him and endorsing his opponent. And then he gets his first intelligence briefing, after becoming the Republican nominee, and within 24 to 48 hours, there are leaks out of that that are critical of him and his then-national security advisor, Mike Flynn. The first time Trump met the FBI‘s then-director, James Comey, was when the intelligence chiefs chose Comey to tell Trump, then the president-elect, about a collection of “salacious and unverified” (Comey’s words) allegations about Trump, compiled by operatives working for the Clinton campaign, that has since become known as the Trump dossier. That surely got Trump off to a good start with the FBI’s intelligence-gathering operation. It was also a clever way for the intel chiefs to push the previously-secret dossier into the public conversation, when news leaked that Comey had briefed the president on it. It is important to emphasize here the possibly illegal “unmasking“, and the certainly illegal “leaking“, were all based on intelligence reports generated from raw intelligence, and not the raw intelligence itself. It was the FBI (Comey) and ODNI (Clapper) generating the intel reports, including the Presidents’ Daily Briefing (PDB). The CIA provided raw intel, and the NSA generated the raw monitoring intelligence from the characters identified by the CIA and approved by FBI FISA warrant submissions. It would be EXPLOSIVE if it turned out the October 2016 FISA warrant was gained by deception, misleading/manipulated information, or fraud as a result of the Russian Dossier; and exponentially more explosive if the dossier was -in part- organized by the wife of an investigative member of the DOJ who was applying for the FISA warrant; the same warrant that led to the wiretapping and surveillance of the Trump campaign and General Flynn, and was authorized by FISA Court Judge Contreras – who was, until recently, the judge in Flynn’s case. The FBI were running the counter-intelligence operation and generating the actual reports that were eventually shared with the White House, Susan Rice and the Dept of Justice. Those reports, and interpretations of the report content, were eventually leaked to the media. John Brennan effectively (and intentionally) took himself out of the picture from the perspective of the illegal acts within the entire process. James Clapper while rubbing his face and scratching his head had taken the same route earlier. Stay tuned. This is going to get interesting, even while the press tries to avoid the major question of whether or not the Russian dossier was used as the basis for surveillance of the Trump campaign and transition team. On Saturday, The New York Post posted an article about the impact of President Trump’s drastic cutting of government regulations. Last week, the White House finally wrested control of the mammoth regulatory agency following the resignation of CFPB Director Richard Cordray, an Obama appointee and liberal Democrat who quit his special five-year post early to run for Ohio governor. Trump installed his conservative budget director, Mick Mulvaney, to temporarily take over the powerful agency — which has the authority to determine the “fairness” of virtually every financial transaction in America. On his first day on the job, Mulvaney instated a 30-day freeze on all new hiring and regulations at the CFPB, triggering a collective sigh of relief from the financial industry. So what sort of activity has the CFPB been involved in? •Retained GMMB, the liberal advocacy group that created ads for the Obama and Hillary Clinton presidential campaigns, for more than $40 million, making the Democrat shop the sole recipient of CFPB’s advertising expenditure, Rubin says. •Met behind closed doors to craft financial regulatory policy with notorious bank shakedown groups who have taken hundreds of thousands of dollars in federal grant money to gin up housing and lending discrimination complaints, which in turn are fed back to CFPB, according to Investor’s Business Daily and Judicial Watch. •Funneled a large portion of the more than $5 billion in penalties collected from defendants to community organizers aligned with Democrats — “a slush fund by another name,” said a consultant who worked with CFPB on its Civil Penalty Fund and requested anonymity. What’s more, CFPB has secretly assembled giant consumer databases that raise individual privacy as well as corporate liability concerns. One sweeps up personal credit card information and another compiles data on as many as 230 million mortgage applicants focusing on “race” and “ethnicity.” Yet another database of consumer complaints contains more than 900,000 grievances against named financial companies without any vetting to determine their merit, points out Alan Kaplinsky, lead regulatory compliance attorney at Ballard Spahr LLP. Do we really want to use taxpayers’ money to continue to fund the CFPB? This agency is truly a threat to our existence as a viable constitutional republic. On Tuesday, CNS News posted an article about President Trump‘s agenda after tax reform. It is an ambitious agenda that would do great things for America. Welfare is needed as a safety net–it should not be a career choice. It is time to examine what we are doing to educate those children from families where education is not seen as valuable. It is time to make sure that children who graduate from American high schools know how to fill out a job application, a college application, etc. The key to welfare reform is education and providing a reasonable transition from welfare to work. I think we can do that if both parties in Congress would work together. “I think there’s no secret,” Sanders said, noting that Trump had spoken about it during the campaign. “And when we have specifics on what that will look like, we’ll certainly announce them and roll them out. I don’t anticipate that happening over the next couple of weeks. We’re very focused on tax reform and making sure we get that done by the end of the year. To be a healthy country, we need to give Americans opportunities to improve their lives through education and hard work. Welfare reform would be a step in that direction. I am sure much will be made about President Trump‘s changing his position on Afghanistan. At least he is willing to listen to those around him. I would like to leave Afghanistan behind–I have family members who have been there and may return in the future–I wonder about the wisdom of our involvement. However, there were a few things I heard in the speech the President gave last night that I thought were very encouraging. He formed a study committee and actually listened to their recommendations. That is a trait of a good leader. President Trump noted the lessons of Iraq, where early withdrawal of troops left a vacuum filled by terrorists. President Trump also acknowledged the role of Pakistan in international terrorism. He also noted that decisions have to be made on the basis of where we are–not where we would like to be. Anyone who is acquainted with strategy in any situation understands the wisdom of not telling your opponent what your next move is going to be. War has to be fought to win. The people in the field understand what is needed and how to accomplish what needs to be accomplished. We need to let them do what they do best. I look forward to the day when American troops are no longer needed in Afghanistan. However, I celebrate a President who understands that we need to fight this war quickly with the goal of winning. The harder we fight, the sooner we get to bring our troops home. I believe President Trump’s policies will make a victory and a return of our troops possible. On Tuesday there was a rally in Washington, D.C., to support continuing the DACA program. This is the program that allows children who were brought to America illegally by their parents at a young age to remain in the country. There are some good aspects of this law–this is the only country these children have ever known, and theoretically these children have adapted to American culture. However, DACA was never proposed as a law and Congress was never given the chance to vote for or against it–it was done by Executive Order. The downside of DACA is that it encourages illegal immigration. I suspect there is a compromise somewhere in the middle, but I haven’t seen it yet. But we need to look at this rally in light of who put it together and who handled the expenses (the signs and the t-shirts were not homemade). Breitbart posted an article today about the backers of the rally. At the protest, more than 25 open border activists were arrested by Metro Police outside of the White House, according to Democracy Now. DACA recipients are given protection by the federal government and since the Trump Administration has not ended the program. Experts like Mark Krikorian have previously said that 800 new permits for protected DACA status can be granted by the Department of Homeland Security (DHS) per day. Immigration hawks have long criticized the temporary amnesty program as being unconstitutional, mainly because former President Obama enacted the program through executive order. Since DACA’s inception, potentially dozens of recipients of the federal protection may be MS-13 gang members, Breitbart Texas reported. There is a pattern here with the current unrest that we need to note. Many of the people protesting are paid, many of the people protesting have ties to international movements working against America, and many of the people protesting have no idea why they are protesting or who they are involved with. Donald Trump is a serious threat to those who seek global governance. The political left, the establishment Republicans, and the globalists are all very unhappy about the results of the last election. Up until the election of Donald Trump, things were traveling in the direction they wanted to travel, and he has thrown a real wrench in the works. They are not going to take this lying down. If Americans truly want America to be the country that was founded in 1776, they are going to have to get involved, find their own news sources, and stand up against those who want to take our freedoms away. We need to remember that the group that controls the vocabulary controls the news narrative. Hate speech can be used to describe any speech that does not conform to the mainstream media template. Have you ever wondered why the media refers to pro-life people as ‘anti-abortion’ and pro-abortion people as ‘pro-choice’? Have you noticed the attempt to declare anyone espousing conservative values as a racist or bigot? Why is it homophobic to support marriage the way it has been for centuries? Why is the church being asked to condone homosexual marriage–isn’t it enough to allow it to be legal? There is an attempt to undermine America’s cultural and moral fiber that has reached major proportions in the past few years. Either we are going to fight to preserve those morals and that culture or we are going to have to explain to our children and grandchildren why we were unwilling to defend their freedom. On August 4th, Daniel Greenfield posted an article at Front Page Magazine about National Security Council head H.R. McMaster. Daniel Greenfield has concluded that McMaster is part of the deep state and is working against the interests of both America and the Trump Administration. At this point I should mention that like it or not, Donald Trump is the President, and working against Donald Trump is working against the interests of America. It is not patriotic to oppose anything and everything the Trump Administration proposes–it is obstructionism. The Washington establishment’s worst nightmare is for the Trump Administration to succeed–that will be the end of their stranglehold on our government and their success as an elite class. It seems as if the NSC under McMaster has turned political, gotten totally out of control, and needs to be promptly reined in. Please follow the link to read the entire article. It is chilling to think that a group of people have become so entrenched in a government agency that they will risk the security of America to remain in power. 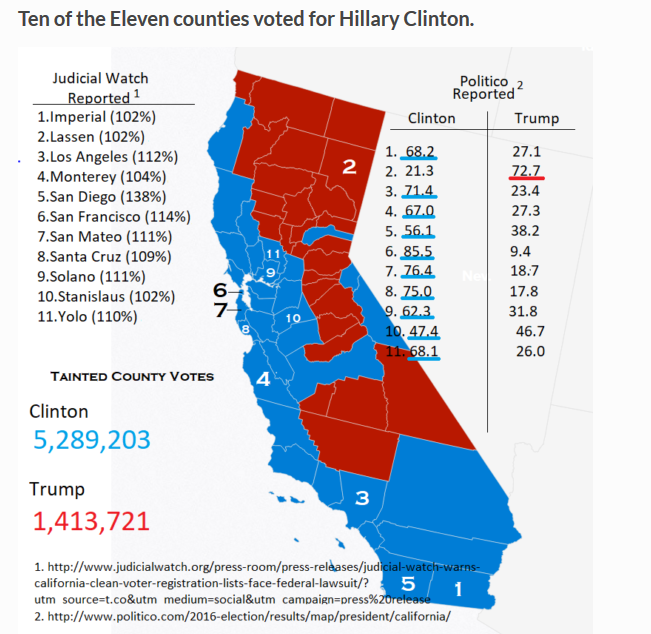 The Gateway Pundit posted an article today about California voters. The article notes that 10 out of 11 counties where there are more registered voters than adults of voting age voted for Hillary Clinton. Obviously it is possible that fact is simply a coincidence, but then it is also possible that 90-foot alligators live in the sewers of New York City. In a number of those counties, illegal Democratic voters would not have changed the election result. However, we need to remember that every illegal vote cancels out the vote of a legitimate voter. That is unacceptable. That statement is a really good example of the concept of ‘spin.’ Don’t confuse the issue with facts!